As a Dementia Behavior Detective, you can start to understand and address challenging behaviors with your loved one with dementia. People with dementia often lose their ability to communicate their feelings using words. Instead they communicate through behavior. What does it mean when someone is pacing, wringing hands or moaning? Finding out is our task! In our book Coping with Behavior Change in Dementia we suggest becoming a behavior detective. 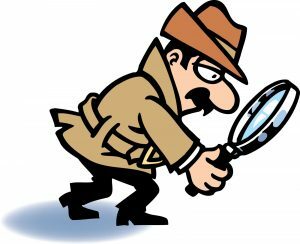 Like detectives, caregivers need to observe, investigate, and draw conclusions. We watch a challenging behavior over several days, taking notes in a simple record or log, to try to identify a pattern that helps us figure out the cause. For example, Ann was diagnosed with Alzheimer’s disease 5 years ago. Her husband George has been caring for her alone in their home where they have lived for many years. Ann is self-sufficient in eating and using the bathroom, but needs reminders and assistance to shower. She does not like to change her clothes and has been wearing the same clothes for several weeks. Ann sleeps about 15 hours a day, going to bed around 7:30 pm and getting out of bed between 10 and 10:30 in the morning. Mornings are the calmest time of day, anchored by their habit of going out for pastry, coffee and juice to a nearby bakery. George and Ann split a sandwich for lunch around 1 pm with ice tea and a cookie. Ann has developed a real sweet tooth. To keep her from eating only cookies, candy and ice cream, George locks the sweets in the pantry. With encouragement from a fellow caregiver, George began to keep a behavior log to see if it would shed any light on Ann’s behavior. This behavior log gives us some information and some ideas of why Ann might be acting this way. Now it’s time to put on your detective cap. What is Ann’s behavior trying to tell us? What might George do to help Ann? There is a consistent pattern related to time of day. Mid-afternoon is difficult for Ann. We need to think about possible reasons for this. Ann may be feeling alone and insecure. She wants George’s attention. George does not understand that Ann’s behavior is a symptom of how she is feeling. He is finding her behavior so stressful that he reacts by yelling, which only escalates Ann’s anger and agitation. It may help George to know that agitation and anger are caused by the disease, and that Ann is not able to control her behavior. George might try planning an enjoyable activity that Ann can do, such as washing dishes, looking at a photo album, or dusting. Going for a drive or taking a walk before mid-afternoon when Ann’s agitation usually begins may help. It is often easier to prevent a behavior by changing a routine rather than respond to the behavior once it has begun. The TV might have upset her. On one occasion the TV was on. Was she watching something she might have misunderstood or misinterpreted? Could she be confusing TV with reality? News programs that report violence or disturbing events, action or ‘thriller’ shows may be difficult for Ann and causing her distress. Her sugar craving may be increasing her agitation. As the brain changes, people with dementia may crave more sweets. Although by locking up sweets, George is doing what he thinks is best for Ann, giving her an afternoon snack of yogurt, fruit or a cup of cocoa may help reduce her cravings and her agitation. Ann may simply be hungry. She has not eaten much for breakfast or lunch. Starting the day with toast, eggs or cereal or something with less sugar may sustain Ann longer. A larger lunch might help too. George could document whether eating larger meals affects Ann’s level of agitation in the afternoon. Or he could try giving Ann a snack a couple hours after breakfast rather than waiting 3 or more hours. What beverages is Ann drinking? We know she has coffee with breakfast and tea with lunch. George could try decaffeinated coffee or tea or substitute another beverage for tea. Caffeine can make anxiety and agitation worse. Part two of Becoming a Dementia Detective covers other possible strategies, but our takeaway here is: A log that helps you track behavior is the first step to understanding the behavior—and then finding ways to change things up that can head off or lessen the behavior. Good luck!